Beautiful and RARE certificate from the Columbus Zoological Company issued in 1903. This historic document was printed by the "Ohio Company, Columbus, Ohio" and has an ornate border around it with a vignette of an eagle and has gold gilded printing. Embossed corporate seal on lower left. This item has the signatures of the Company�s President and Secretary, and is over 110 years old. Some wear on folds. 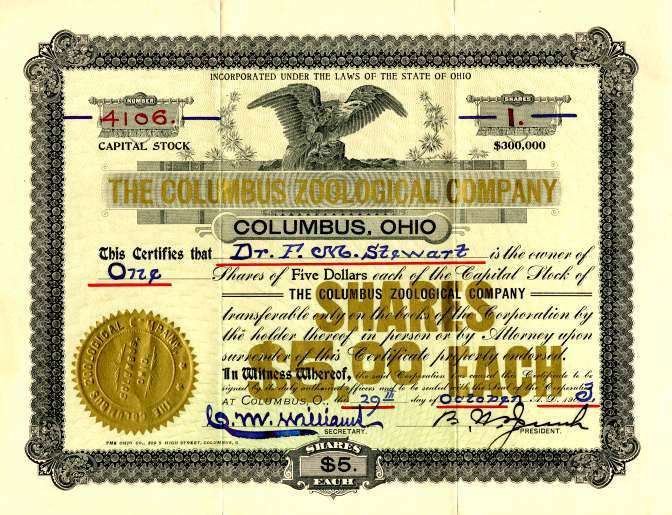 The Columbus Zoological Company was incorporated on February 16, 1895 and in 1902 purchased 214 acres of land previously owned by the Rathbone and later the Wetmore families for the purpose of building a Zoological Park in Columbus, Ohio.